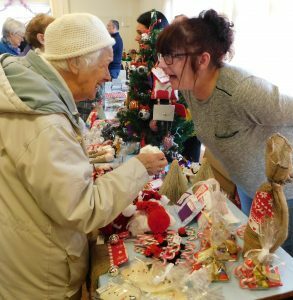 No, you’re not seeing things at N-Vision’s Christmas Fair – with the greatest respect to our own alter ego The Blackpool Fylde and Wyre Society for the Blind. The Dark Knight wowed children and grown-ups alike when he dropped in to join his friend Santa Claus for a super heroic fundraising festive fair which featured stalls, tombola, donated goodies from supportive local stores and businesses, festive treats packed or prepared by residents of the Princess Alexandra Home and some great gifts grown on the premises or crafted with the help of the resident bees thanks to the charity’s garden ‘roomies’ Urban Organic CIC. 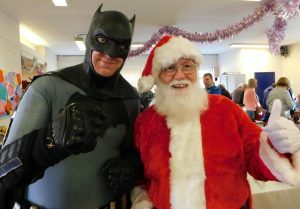 Now obviously Santa is simply Santa and he has been known to help out at the charity’s shop at Cleveleys when his Santa Nav is playing up – but we can’t really comment on rumours that Batman is constantly on call to the charity via our IT technician Chris Carter. We can confirm the two super heroes really helped bring the magic of Christmas to charity staff, volunteers, friends and families and packed a real kapow-krunch to the festive takings – the event raised more than £2000 and attracted around 160 visitors. And if it all happened about a month ahead of schedule can you blame either of them – Santa’s got a busy few weeks ahead of him and a new Batman film in 2019 is still top of many wish lists.